First book in the series and it is very gripping from the first page. It continues on with: A Gift of Ice, Tower of Air, and War of the Black Curtain. It is full of adventure, riddles, magic, and the ever nail-biting conflict of good vs. evil. I highly recommend it! I'd heard a lot of great things about this book and have been excited to read it for some time. However, I found the book to be quite mediocre once I finally had the chance to read it. With all of the fantasy stories that flooded the market after the Harry Potter series, I think authors really need to dig deep in order to find a way to make their story unique when writing in this particular genre. To me, A Door in the Woods felt like every other ordinary-kid-finds-out-he-has-magical-powers-and-is-the-only-one-who-can-save-the-world-from-impending-destruction story. There just wasn't anything in the story to set it apart from a lot of other books that are out there. To begin with, the plot didn't feel very fleshed out to me. It seemed like the story line hadn't really made it past the beginning stages of the writing process yet. I felt that the author had decided on some cool things he wanted to put in a story but hadn't really figured out why they were important to the overall picture or how they were all going to pull together. Some parts were confusing, and I never really understood how all of the pieces fit together. I realize that this was probably done in part to "hook" the reader and make them want to continue reading the series, but it mainly made things feel disjointed and contrived. I also didn't feel that the writing was particularly well done. As an elementary school teacher, I talk to my students a lot about the need to show and not tell in writing in order to paint a picture for the reader. I felt that there was a lot more telling going on in this novel than anything else. I think this was partially due to the fact that the novel was written in first-person, but the book also just had an overall bare-bones feeling to it. The characters were pretty stereotypical to me, too. I kept waiting for the villains to tie one of the good guys to a railroad track. The bad guys never really move past a "Grrrr! I'm evil!" image and the good guys were just...good. The characters were flat and lacking in depth, and I never became attached to them in any way. This may be one I'd recommend to reluctant readers that are more interested in action than plot, but I think more sophisticated readers would have a hard time remaining engaged with the story. I really struggled on whether to give this 2 or 3 stars. The writing for this fantasy book was only so-so as was the story, although it did keep me interested until the end. Some of the fantasy creatures and situations seemed a little over the top. I was reminded of a character in a cartoon that has painted themselves into a corner. Suddenly they use the paintbrush to paint a door or window so they can escape. Some of the things in the book felt that way, as if they were created at the last minute just to extricate the characters out of the corner the author had placed them in rather than because they actually belonged in the story. This is a series and the 1st book definitely does not reach a conclusion. I am interested enough to read the 2nd book so will stick with the 3 stars. NOTE: Other reviewers seem to really like this book, especially the younger kids so if the synopsis appeals to you, it could be one you'd end up liking. This was a really quick and easy read for me. I enjoyed following the beginning to Jimmy Fincher's tale. The author caught my attention in the first paragraph when Jimmy mentions he cannot be destroyed. I was curious to see how this all would play out. It was a nice adventure to get to the end of this book.Jimmy was a normal 14 year old by with a Mom, Dad, and an older brother living in a town called Duluth, Georgia. Until the day he was climbing a tree and saw a man dragging a woman fighting into the woods, then she just vanishes. Where did she go? And why is this man... Oh, Jimmy nows this man... The whole story just takes off from here.Jimmy is sent by his dad to find an old friend, not knowing exactly where this friend lives or what he looks like, whos name is Joseph. Then he is told by his dad to be scared, that being scared will keep him alive.On page 3 of the book there was one paragraph I just loved and really made me look forward to the fun tale that was going to be told with a childs view and discription on things, which does make it easy to see knowing what a kid sees. "Before I begin, there are things to say. You must prepare yourself. The world is not what you think it is, and the nightmares that sometimes wake you in the middle of a storm may be truer than you think. Every novel you've ever read may not be as fictional as you thought. If I have learned anything, it is that nothing is beyond possible or belief. The world as I once knew it has turned upside down, and I've finally realized that the phrase "truth is stranger than fiction" is not just a stupid cliche."" I thought this was a good book, but The 13th Reality was much better. This author has definitely gotten better along the way. This book has a more juvenile feel to it than most books I've read for this age group.We have an ordinary character, just your normal kid who's in the wrong place at the wrong time. He has a good relationship with his family. He tries to to what is right even if he's scared. The bad guys here are pretty bad. And scary. And bad stuff does happen.I came away from this feeling like I didn't want my kids to read it though and I didn't want to read it to them. I'm also not particularly interested in finishing the series. I wouldn't let kids younger than 12 or so read it because of the dark stuff. I just finished reading the whole Jimmy Fincher series. These books are very easy reads. I read all four books in two days. This series is good to read if you just want something relaxing and entertaining to read.These books are quite imaginative and are a close second to Fablehaven. I like Fablehaven better because the books in that series are longer so I can enjoy each book longer. I think the Jimmy Fincher books were way too short. The whole series could have fit into one book. I would suggest you get the whole series from the library before you start reading it because the end of every book leaves you with a terrible cliff hanger. I loved this book! It was so intense and interesting. I could not put it down. This would be a great adventure to have! I have read this over and over. This should definitely be at the top of your book list!!! Unbelievable!!! A good young reading level book. I'll probably read it with my kids someday.A good young reading level book. I'll probably read it with my kids someday. Reviews require six more word things. "The world is not what you think it is, and the nightmares that sometimes wake you in the middle of a storm may be truer than you think. Every novel you've ever read may not be as fictional as you thought. If I have learned anything, it is that nothing is beyond possible or belief. The world as I once knew it has turned upside down, and I've finally realized that the phrase 'truth is stranger than fiction' is not just a stupid cliche" (3-4)3.5 stars. This is the story of an ordinary 14 year old boy, Jimmy Fincher, who in the course of one fateful day goes from being a carefree, happy youth to a "bona fide murder-witness, kidnap-victim, hostage, and escapee all rolled into one" (27). And that's only the beginning of the story. From there, things go from bad to worse as Jimmy quickly learns that nothing is what it seems, and the world that he once understood is much more "strange and terrifying" than he originally thought (21). At its most basic level, this is a quest story. Meaning there is a hero, a great journey towards the ultimate goal, tasks that must be completed, and villains at every turn. What makes it original though is that it is told in Dashner's signature style. For those who have readThe Maze Runnertrilogy, this series is going to feel very familiar. Instead of Grievers, WICKED, The Flare, the Gladers, and The Maze, there's The Stompers, the Union of Knights, The Random Rippings, the Givers, and The Door. What makes this book even better though is that Jimmy is an unlikely hero: he cries, he wets his pants, at times he even faints. However, this only makes Jimmy that much more likeable and relatable and for any kid who has ever been the underdog, which lets face it almost all of us are at one time or another, it makes the story that much more exciting. At only 188 pages, this is an extremely short read and does a great job of setting readers up for the remaining books in the series. I would definitely recommend this book for anyone looking for a quick read, or anyone who has read and liked any of Dashner's other books. Although extremely simplistic in style, his books are always fun and enjoyable reads. I feel like this story gives us very little explanation about what is going on most of the time. The action carries us away with mostly unanswered questions, but I guess I can understand why. It is the beginning of a series after all, so it is mostly focused on setting up for the rest of the series. I guess I can wait for another book or two to get my answers. I really enjoyed this story just because the voice was so stinkin' fun. It really did sound like a 14-year-old boy talking. It was a little odd that all of the other characters talked the same way, but I could forgive that just because it was so delightful to hear and just seemed to add to the charm of this book. It portrays the attitude of a young yet fairly sweet and innocent teen boy really well. I also found Jimmy's attachment to his family very refreshing. With so many stories out there, particularly those written for this age group, that show dysfunctional and fractious families, it was really nice to see an example of a strong one. The parents are still happily married to each other, the siblings recognize that they love each other despite the obligatory teasing that goes on between them, and Jimmy genuinely trusts his father to make everything right. Of course this wouldn't be Jimmy Fincher's story if his dad had done so. There comes a point where Jimmy has to step up to the plate and become the hero, but it is sweet what childlike faith he has in his parents and how devoted he is to ensuring his family's safety. I am eager to see what happens to Jimmy and his family in the next few books. Whether this was the author's first book or not, I wonder just how it got published with so many annoying things about it. I listened to a recording with my family over a road trip, and if you're looking to enjoy the book DO NOT LISTEN TO THE RECORDING. The reader sounds like he had to get seriously stoned before consenting to read the book.Aside from the awful recording, I still didn't enjoy the book at all. Dashner seems to be writing only for the plot, which wasn't as good as it could have been, but the plot was detracted from often by Dashner's obscure similes and weak writing.My favorite went along these lines:"The key fit right into the lock, like a spoon sliding into a bowl of cereal. "Um...what in the world? I have no idea how that metaphor is supposed to enhance my understanding of the event. And unfortunately, about 90 percent of his metaphors were of that caliber. That was my biggest issue with the writing, my second biggest is with the awful use of colloquialisms. He overused a bunch of really annoying and inappropriate (in terms of the context or the tone of it, not anything age-inappropriate or stuff like that) phrases that made it really difficult and not enjoyable to get through.Overall, this book would probably be okay for elementary-level readers who only need the plot to get them into it and who wouldn't be annoyed by the poor writing. If you're hoping for a new Harry Potter-type plot, you've got it. If you're hoping for some quality writing (which JK Rowling has! ), then look elsewhere. A Door in the Woods is the first book in James Dashner's Jimmy Fincher Saga, and it's a decent start to the series and a decent first book for Dashner. The writing isn't all that bad, but there is room for growth. Dashner relies a little too heavily on what I'm sure he is trying to play off as quaint, southern colloquialisms. Every character in the book uses them, and after several chapters, it gets a little old.Jimmy Fincher is your typical, fourteen year old boy, who happens to stumble upon a secret that could change the world. Through his adventures, he uncovers family secrets, villains, enigmatic benefactors and unlikely friends. Unlike the typical YA book today, Jimmy has a solid family unit around him that he relies on and that supports him throughout the entire book. 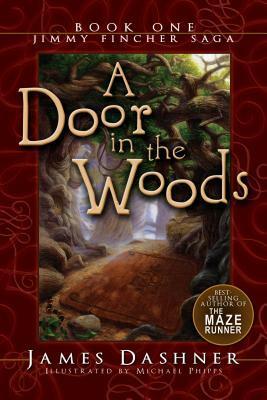 I find this a refreshing change.While I could see where the book may have benefited from a little tighter editing, overall A Door in the Woods is a fun read and I think most kids would find it enjoyable; it's filled with adventure, mystery, intrigue and life or death situations. I'm looking forward to reading the rest of the series. I have found a new favorite author. This book is definitely for a younger audience than Maze Runner. I loved this book and see it as great read for my kiddos especially my son. It's very plot driven, a lot of action not much character development. It's narrated by a young boy and so some of the writing isn't always the best imagery or simile but I think that's the point. What young boy would talk with literary finesse? Some of his comments made me giggle. "I was as confused as a blind squirrel with no legs". Lol anyway it's a kids fantasy book and I LOVED how his family was in the story the whole time. At the intro and then saving him then getting captured and then rescued. It wasn't like your average I'm a hero boy/girl and I either need to a) ditch my family to save the world or b) my family died (either one parent or both) or c) I had a horrible upbringing and grateful I get to save the world instead of live with them. There's a lot of unanswered questions but that's true of so many series. It was a quick read and can't wait for the next one. Right off the bat I have to say the cover art on this book is gorgeous -- so rich and beautiful. I've read Dashner's two 13th Reality books and thought I would enjoy these Jimmy Fincher books as well. I wasn't disappointed. I have to say that the reader can see Dashner's growth as an author from Fincher to 13th Reality, but he was pretty skilled to begin with. This book seems to be for a slightly younger audience - as it is quite a bit shorter and is written in 1st person from the boy's point of view. I prefer 3rd person for a reason I haven't quite figured out, but once the story got going, I got over it and enjoyed the ride. This book was slightly different from many others in this genre in that the main character does not discover hidden powers within himself. He simply makes noble choices when faced with challenges and becomes powerful in the process. That and Jimmy's intense love for his in-tact family make this character very appealing. I look forward to reading the rest of the series. I don't know if it's just because I read so few juvenile adult books, or because James Dashner is not a good writer, but what ever it is, I didn't like this book. It didn't feel fresh or new. I didn't care for the main character much, a young teen, nor did I care for the antogonist. Both were too flat and one dimensional for me. The plot seemed to go on and on and on and on and....It just never ended! (Well of course it ended, all books have an ending, but this is just the first book in "The Jimmy Fincher Saga" and I have no interest in finding out what happens to everybody I've been introduced to! )I only read this book because a young friend of mine mentioned meeting a favorite author of hers and so I checked this out and only perservered because I do really admire and respect this young woman. I'm hoping my boredom with this book is simply because I don't understand the young male teenage mind. But I don't think so! This was Dashner's first published novel, and I think it shows. It doesn't feel as polished or clean as books like The Maze Runner. In particular, there are a LOT of analogies. For the first good chunk of the book every time something was described it was described as being like something else. I can't tell if this some part of the narrator's character, or just Dashner being a new author.And that's the extent of my problems with this one. The story is short, fun and exciting. It reminds me a lot of the books I read when I was a kid. This excited the parts of my brain that enjoyed The Dark is Rising Sequence. Reading it made me feel like that kid again, and I couldn't wait to start the next book. This was a hard book to rate. The suspense was really great and at least a 5. If it wasn't for the suspense I would have quit reading long ago. The story line was good and the fantasy fun. I don't know who edited this book but the grammar was atrocious. The extreme overuse of clichés was terrible and really distracted me from the story. In fact the author was a big distraction in reading the book. But the biggest problem was the things he had a 14 year old boy do and say. It really distracted from an otherwise good book. It was obviously written "down" to a 14 year old by an adult and not presented as a 14 year old looking "up." So I would say it was a good story but not a good read. But I would say it was worth reading but just be prepared for some a writing style that might not be what you are used to. It is also worth reading so you can get to other books in the series that do improve in the writing area and story keeps the great suspense. A door in the woodsBy james dashner150 pagesi don't see how this book got published... The story is creative and interesting but the details and some of the characters were too much. the author really took fantasy to another level.I feel that it is a mediocre novel that needs some work on the detailing of things. It is the story of a little boy named jimmy that discovers something that completely changes his view on reality. Old legends come to life, creepy and scary adventures and danger fills the book. This might not be a very creative idea seeing as how many books contain simular themes and topics. but the worse part is the over dramatization. Over dramatization always pushes the reader away from the book, because you start to slowly make fun of how ridiculous it is. my advice is even though it's a fantasy novel try not to over do it or else it becomes a comedy. This is the first of a great series. I was a little sceptical thinking it was another Potter nock off. Completely wrong. The ideas in this novel are great to imagine. I would think these would be great movie. Although movies rarely do a book justice.Jimmy Fincher is a true hero. Too many stories today have a hero who is already a little dark or have a hard time choosing the right. Jimmy always knows the right path and very rarely strays if at all.Mr. Dashner has created an awsome role model for our children.I would recomend to all. A note of caution, some of the themes are a little dark for those that are scared easy. Meaning children of coarse. I always wanted to be a mom that read to her kids, but I couldn't quite get there. More often than not, we just skipped. Until we read this series, that is. My kids an I loved these books so much that we didn't let anything get in the way of reading before I got them in bed each night. When we finished the series almost 900 pages later, the reading at night habit was cemented. 3 1/2 years later, we still read every night. We really are indebted to James Dashner for starting us on our way to enjoying so many great books together! This was definitely for a younger audience. Maybe a 10 year old would appreciate the use of the random sayings peppered througout the book. Like,"what in tarnation!" it was as if he wrote down every saying he could think of and included them all int eh book. not to mention he sounded like a 10 year kid. boy sees a "murder" and is seen by the murderer. gets captured, escapes, gets captured again, family in danger, family gets captured, escapes, goes to place inbetween worlds. must save world. given gift, must find more gifts. yadda, yadda, etc. It's really important when reading youth fiction to remember the target audience. For the audience Dashner intended, this book was expertly crafted. I was hooked by the natural storytelling skills of the main character, Jimmy, and found that this book begged to be read aloud. In a few years, I can see myself reading it to my boys. My only complaint was that there were areas of the plot where I would have loved more detail. But, understanding that the book was not intended for fantasy-devouring adults, this is probably more an asset than a flaw. The book was good, I was expecting something a little different, However James Dashner is an amazingly vivid writer. I love the words he uses and the details he gives. I think every 4th-8th grader should be required to read this book just for the fact that they could really learn alot about imagination and using vivid words in their essays and other assignments. I will definitely be reading the rest of the series. I didn't really care for this book. I liked that the author decided to use an average kid as the main character, and the story was ok and had quite a few action scenes. I really didn't like the actual writing, though. There were some parts of the story that I thought could only be truly understood if the reader was 11/12 and up, but I felt like the actual writing was geared more toward a 7-9 year old. James Dashner - James is the author of THE MAZE RUNNER trilogy and THE 13TH REALITY series. He also published a series (beginning with A DOOR IN THE WOODS) with a small publisher several years ago. He lives and writes in the Rocky Mountains.